Loved this book from start to finish. 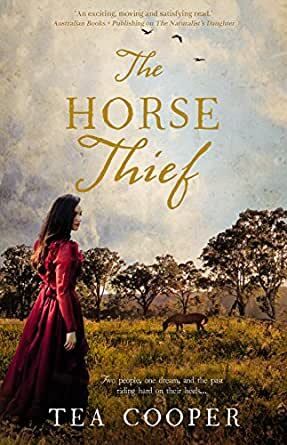 Wonderful storyline and characters set in the beautiful Hunter Valley. Highly recommended. Look forward to reading more from this author. 5.0 out of 5 starsHistory, romance and magnificent horses…sigh! I opened this book and from the first page was transported to the New South Wales Hunter Valley in the mid nineteenth century. If you are a lover of horses and have experienced the magic of the Melbourne Cup, this is a world you’ll want to be lost in. This is the story of India Kilhampton - a strong, independent woman who has been given one year to turn the failing family property into a thriving horse stud. Her dream is to breed a Melbourne Cup winner. When she advertises for a horse breeder, and Jim Mawgan presents himself for work, she is faced with the answer to all her dreams and the destruction of everything she knows. The tangled web of intrigue that Mawgan begins to unravel with his presence turns India’s world upside down and sends her heart spinning out of control. I love that this author’s historical stories are all set in and around where she lives. It brings the books to life. Tea Cooper’s descriptions of the area are so vivid, I find I am no longer a reader holding a book, but I’m walking the property, Helligen, with her, picturing the buildings, smelling the leather and seeing the glossy coats of the horses. Her visceral description of the magnificent thoroughbred, Jefferson, made him linger in my mind long after I closed the book. The author’s secondary characters were powerful and complex, adding humour, mystery and authenticity to the story and balance to the protagonists. And Jim Mawgan was the consummate hero – strong, defiant, loyal but also flawed enough to be believable and, of course, extremely desirable. Loved this book! This was beautifully written and beautifully Australian. The characters had charm, the plot was well-thought out to encompass a now Australian tradition in the Melbourne Cup, and there was an ease of reading that was delightful. Thoroughly enjoyed. I've never been a fan of historical romance, but this book may have changed all that! Loved the characters and the story line. The fact it was set in Australia made it even better. I may be a new convert to Oztoricals (Australian historicals). A sweet/clean read I'd recommend to anyone. Amazing book couldnt put it down. Love all of Tea Coopers books! 4.0 out of 5 starsGirl tries to make good in a mans world. Story line good, with a few unexpected twists.